In the summer of 1947, according to local lore, a spacecraft of extraterrestrial origin allegedly crashed near Horse Springs, NM. Legend has it that several witnesses, including a local official, found the crashed disk – along with four aliens scattered among the debris. For decades, an army of armchair UFO investigators have attempted to find the crash site and some have even claimed to have found it – along with debris that was allegedly “not from this world.” In an effort to put the legend to rest, in 2013 the Aerial Phenomenon Investigations Team (API) embarked on an expedition to find the crash site. After a successful expedition, coupled with a thorough investigative process, the API Team is strongly convinced they have finally solved the mystery. 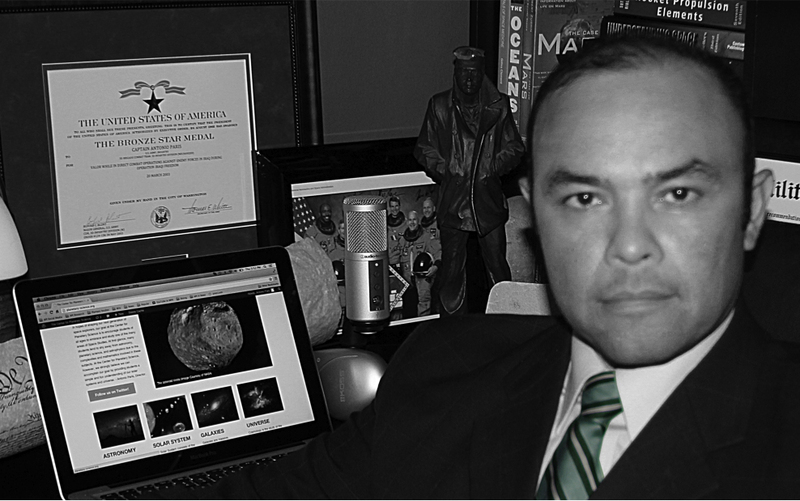 Antonio Paris, the Founder and Director of the organization Aerial Phenomena, is a former US Army Counterintelligence Officer and Department of Defense Counterintelligence Special Agent. He was awarded a Bronze Star for combat operations in Iraq during Operation Iraqi Freedom. Today, Antonio works for the science, technology and engineering firm Science Applications International Corp. (ISR & Space Solutions Operation) in the Washington, DC area. He has a Bachelor of Science in Computer Information Systems from The City University of New York and a Master of Science in Planetary Science from the American Public University. Antonio, moreover, is the Director and Founder of the Center for Planetary Science – an online science program bringing astronomy, planetary science, and astrophysics to the next generation of space explorers. Antonio is also a member of the Washington Academy of Sciences, the National Capital Astronomers, and is a certified STAR Team Field Investigator, Dive Team member, and Assistant State Director for MUFON. He has appeared in dozens of radio shows, webcasts, and cable TV interviews, including consulting work for the popular TV series Unsealed: The Alien Files. He is the author of Aerial Phenomena: Reviving Ufology for the 21st Century; and the director and producer for the popular documentary Area 51: A History of this Reclusive Base. For more information, call the 24-hour Skeptic Line at 240-670-NCAS (6227).